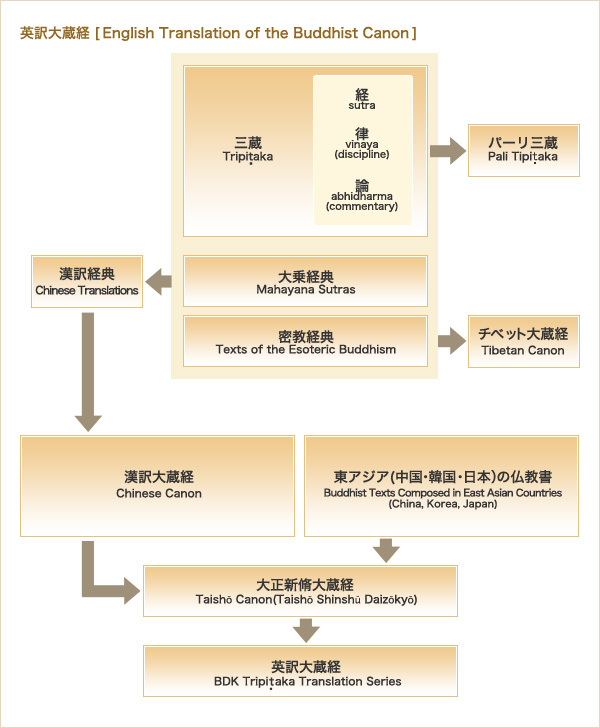 The English translation project of the Buddhist Canon began in January 1982, when Rev. Dr. Yehan Numata, the founder of BDK (Society for the Promotion of Buddhism), established the Editorial Committee of the English Tripiṭaka Translation Project. The Buddhist scriptures known as "sutras" constitute a part of the Tripiṭaka. "Tripiṭaka" (three collections) is comprised of the Sutra Pitaka, the Discipline Pitaka, and the Commentary Piṭaka. "Piṭaka" in "Tripiṭaka" means "collection." In China, Indian scriptures from the early period and the later Mahāyāna scriptures were transmitted without distinction between the two. These were, then, translated into Chinese from the Later Han to the Northern Song periods (148 -1129). These were, then, combined with the works of Chinese commentators to produce what came to be known as the "Buddhist Canon." In Tibet, the translated scriptures were divided into the words of the Buddha (Kanjur) and their commentaries (Tenjur). These two sections were brought together to comprise the Tibetan Canon. As of today, 69 works have been translated in 41 volumes to make up the "English Buddhist Canon." The remaining works are being translated by Buddhist scholars in over ten countries throughout the world. We are making every effort to complete the first stage of the project at the earliest possible time. ※The "Mahāpiṭaka," the newsletter of the English Tripiṭaka Translation Project, is published annually. It includes, among other items, the reviews of translated works. ※The date of English Tripiṭaka translation project is available on the website of "The SAT Daizōkyō Text Database."